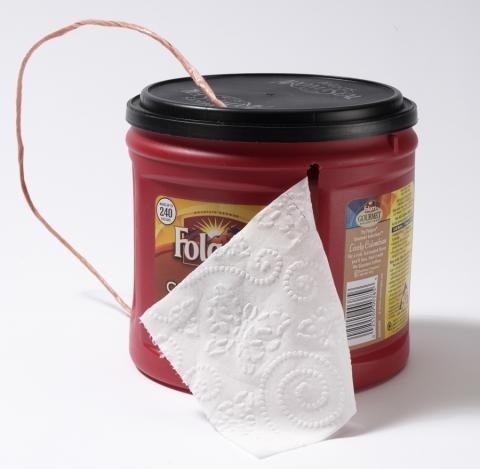 Old empty plastic Folgers buckets are one of my favorites. They’re light, yet durable. The easy-to-apply lid is also airtight. They even have little grips meant for the human hand. With a little slit cut it one, you can make a genius toilet paper dispenser. It’s the perfect unit to take camping. The plastic enclosure will make sure it has the best chance possible of staying dry. If you’re really worried about not letting the wet in, you can even forgo the convenient slit. The piece of twine pictured above lets you hang the contraption from the nearest tree. All the comforts of home, but in a forest! Here is a link to the Folgers cans used for this project. You have to buy them full of coffee, then stomach 270 cups of Folgers. Or try to find some in the recycling bin, that’s where I found mine. Brilliant. I will be taking one these on our next camping trip. We have used this idea at our camper for years. No cuts or slits though, that just allows bugs and critters to get inside. Hey! I happen to LIKE Folgers coffee. Interesting use for one of those plastic containers I keep generating. I like the idea of a container for my TP. I hate what they put out at campsites at state/national parks. This will work.